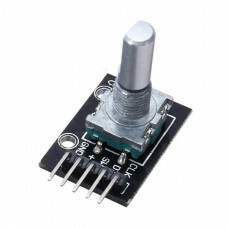 A 360 Degree Rotary Encoder is a Bread Board Friendly extremely precise module that provides an indication of how much the knob has been rotated AND what direction it is rotating in. It is an incremental electro-mechanical device that converts the angular position or motion of a shaft or axle to digital code. The output of incremental encoders provides information about the motion of the shaft, which is typically further processed in processor / controllers into information such as speed, distance, and position.